(NaturalNews) Heart disease and cancer in all their different forms take the lives of nearly three-quarters of all men, women and children in the US each year. Yet thousands of well constructed research bodies have shown that most chronic diseases can be prevented by making simple lifestyle changes including diet, smoking, physical activity and exposure to toxic household and environmental pollutants through our early and middle adult years. Specific foods and nutrients such as resveratrol, curcumin, green tea and leafy greens have demonstrated specific properties that help to prevent and fight cardiovascular disease and cancer, and should be included as part of your regular daily diet and supplement plan. A research study team based in Spain has published the result of their research in the journal, BMC Medicine that explains that those who eat nuts more than three times a week had a reduced risk of dying from cancer or cardiovascular disease than non-nut eaters. To conduct their research, scientists looked at the effect on the prevention of cardiovascular disease when the participants were put on a Mediterranean diet with extra nuts and extra virgin olive oil, compared with a control group following a low-fat diet. 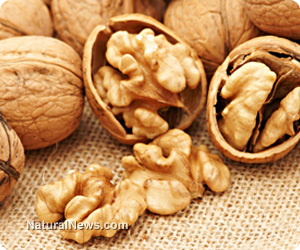 The scientists analyzed more than 7,000 people aged between 55 and 90 years, and divided them into two groups based on adherence to a Mediterranean style diet that included nuts, and especially walnuts, or those following a low-fat diet. The team found that people who eat more than three servings of nuts (1 serving equal approximately one ounce) a week had a 55 percent lower risk of death from cardiovascular disease and a 40 percent reduced risk of death from cancer. Lead study author, Dr. Jordi Salas-Salvad commented “How nuts are able to prevent premature mortality is not entirely clear, nor why walnut should be better for you than other nuts. Walnuts have particularly high content of alpha-linoleic acid and phytochemicals…, along with fiber and minerals such as calcium, magnesium and potassium, may contribute to their healthy effect.” Past studies have demonstrated that walnuts in particular are a beneficial part of a healthy diet and are the best source of antioxidants, containing twice the amount as normal nuts. Researchers also note that people who ate nuts had a lower body mass index and smaller waist. Further, this group was found to be more physically active and less likely to smoke. The study authors conclude “Questions about specific constituents, amount, duration and type of nuts to be consumed remain to be elucidated. Meanwhile, we might need to focus on the question of how to better promote nut consumption in the population and sustainably integrate it into the daily diet.” Nutrition experts recommend replacing one daily serving of fruits and vegetables with a one ounce serving of raw nuts to significantly lower the risk of dying from heart disease and cancer. This entry was posted in Health and tagged Farmington Hills chiropractor, heart disease, walnuts by tiptonchiro. Bookmark the permalink.